When moving equipment, John Miller advises to wash the machine thoroughly to remove all mud and debris. Not only will routine maintenance extend the life of the complete mud system, but it will also extend the unit’s individual components which in turn, assist in the prevention of premature failure of the unit. General maintenance on a recycler is fairly straightforward, and can substantially prolong the life of the equipment. Check the oil and water on the power unit at least once a day. Make sure there is adequate pressure on the cones while drilling to ensure optimum cleaning. Test the bottom of each cone with your finger to feel for a vacuum or suction action while running. Take the time to ensure proper screen size selection and that the screens are free of tears and in good condition. Conduct routine visual inspections of the frame, electrical and/or hydraulic components. Periodically inspect wires, hoses and connections to identify any damaged items that should be replaced. Keep electrical boxes closed and caps on hydraulic or fuel tanks. To date, we have not been able to make the machine run better or faster using water for fuel or hydraulics. This can be a serious mistake and cost a large amount of money to repair, not to mention downtime. As a side note to this, do not use a screwdriver as an electrical start button! More than once we have found a flat blade screwdriver wedged into an electrical starter holding the contacts together. The electrical panels do not need to be left open for any reason while running. Tires, axles and lug nuts should be inspected and adjusted as needed as well as the brakes. And, always ensure that the safety guards are in place. It is necessary that we all take responsibility to ensure safety on the location and when time is at a premium it may seem easier to leave items off after a repair. The few extra minutes it requires to reinstall the guard may make the difference in preventing a serious accident. Take the time to remember to grease and adjust centrifugal packing on a regular basis. A leak will not only cause a mess but also a hazardous work environment. Bearings require lubrication for long life. Refer to your owner’s manual for all the grease points located on your unit. Electric motors do not require regular grease. Check with the manufacturer on their requirements. Cones can get plugged with debris and make them inactive, thus reducing their cleaning capacity. Screens get torn, allowing trash to get into the system to cause plugging problems. Oil or drilling mud on the deck floor can cause “slip” hazards. When it is time to move the equipment from one location to another, take a few minutes and thoroughly wash the machine to remove all mud and debris. Flush clean water through the system to ensure that all suction and discharge lines are clean and clear. 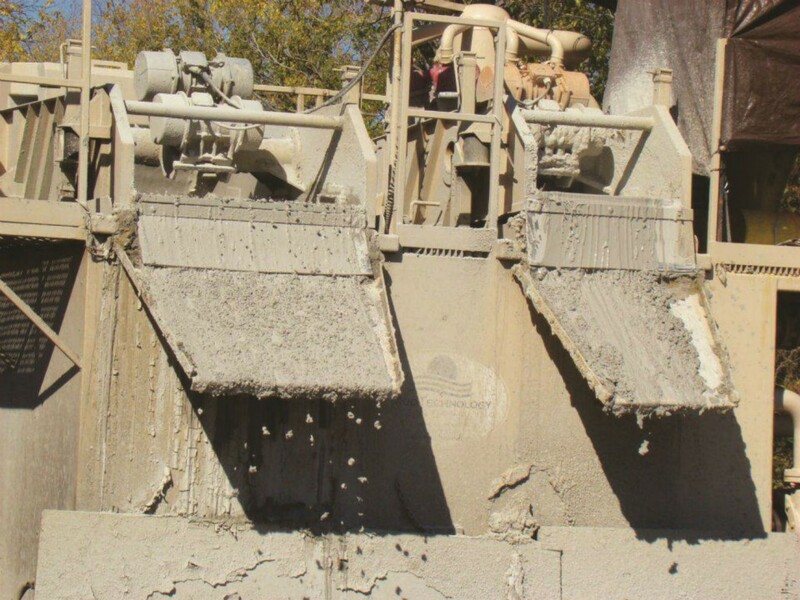 Completely flushing the system can prevent drilling mud from drying in the suction lines, cones, hopper, etc. Remember; in extreme weather conditions be sure to winterize the system. Refusal to do this can result in trouble restarting the cleaning system and a great amount of time and expense to clean out when you should be drilling. While performing the clean-up inspect the unit for any stressed or damaged components. When the mud system is operating properly it is easy to forget to check and grease components as a preventative measure. The focus on a job site is to increase production while decreasing operating costs. While this makes for a better bottom line, it does not always allow for the time or personnel to maintain and repair the equipment. For this reason, as they say, “the squeaky wheel gets the oil” and if it is running we have a tendency to focus on the larger obvious challenges of keeping the drill bit turning. I am often asked what the general lifespan is of mud system when purchased “new” and what factors impact the age. This is a hard question to answer as there are so many variables. For example, the location of service (eg. heavy sand areas vs. slow hard rock drilling or shale), amount of time per day the unit is used (12 hour vs. 24 hour per day jobs), number of days per week and number of weeks per year the unit is used all must be evaluated. What I normally tell contractors is we have units that were built in 1996 that are still in use today and still going strong. We also have had units that had a life of less than five years of hard service that have required refurbishing and upgrading. You must keep in mind that maintenance and conscientious personnel running the equipment will increase the lifespan of any piece of equipment. If you operate in extremely harsh conditions, abuse or neglect any equipment without conducting routine inspection and maintenance, it will not be operating for the long haul. With that said, remember the dirty fluid flowing through the mud system is effectively sand blasting away the interior of the pipes, steel, etc. Wear items such as the hydrocyclones, centrifugal impellors, wear plates and volutes are designed to process the undesirable fluid and over time must be replaced. As these items wear out the efficiency of the unit will diminish, and that means the maximum cleaning capacity will diminish. As Ben Franklin once said “An ounce of prevention is worth a pound of cure.” I keep trying to live by that and instill those words of wisdom by telling field personnel and customers that if properly maintained a mud recycling system can effectively remove the undesirable solids from your drilling mud. This will save not only the wear items on the mud system but also increase the life of the drilling rig: swivel, pipe, and downhole tools. You will become more cost-efficient by permitting the reuse of your drilling mud thereby cutting costs on water, bentonite and labour. Take a minute, step back and give a hard look at any mud system and we will all have to agree on at least one thing: mud systems have a lot of moving parts that must be maintained in order to keep them in premium working order. Training your drilling crew and maintenance personnel to take the time to properly set-up, run, maintain and troubleshoot equipment challenges will not only save time and money but will ensure the long life of the drilling/ mud recycling equipment. Contractors have a tendency to want to keep the drill bit turning, but neglecting basic maintenance will end up costing them.